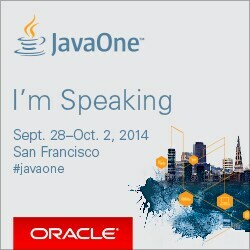 Speaking at JavaOne 2014 San Francisco! This year I have been honored to be selected to speak at JavaOne 2014. Awesome news! I’m excited for this opportunity to speak at possibly the larger Java developer conference in the world. The session that was selected is CON2013: Code Generation in the Java Compiler: Annotation Processors Do the Hard Work. This session is largely based on my work around Annotation Processors as a driver for code generation. It is really a pleasure to see that what was an experimental work three years ago, matures and get the attention of the JavaOne commitee. So, if you happen to be at JavaOne, don’t miss the opportunity and come to the session! See you there!